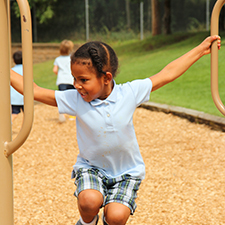 The Mounds Park Academy Lower School is designed to provide a joyful and nurturing environment for pre-kindergarten students through grade four. Lower School is colorful, lively, and inviting. It is also calm and safe so that young learners feel free to explore, ask questions, and develop a sense of who they are. 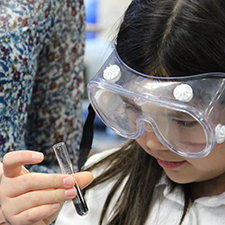 Through hands-on, interdisciplinary learning, Lower School ensures that the curiosity and sense of wonder children come to school with flourishes. Exposing students to a wide variety of subjects taught by subject-matter specialists, including science, drama, technology, fine arts, world language, physical education, and more, helps them see that everything they learn relates to themselves and to our world. And as they begin to understand their place in our world, they become eager to impact it. Each morning, students gather in a homeroom where they begin their journey. Units are written around themes and often integrate a number of subject areas so children learn to graph on the computer when they are measuring their plants, or learn to use research engines when they are writing a research paper. kindling their love of learning. As young students master skills and grow in intellectual sophistication, the curriculum becomes more complex. As skills are mastered, new layers emerge. As discussions deepen, new understanding is gained. As creativity explodes, new solutions are uncovered and opportunities presented. MPA faculty (PreK-12) carefully plan all facets of study to interconnect and build upon each other, year by year. Students remain engaged through challenges and failures because the learning is meaningful, colorful, and applicable to their world. They are happy to come to school each day, no matter the challenge. Students emerge from Lower School exceptionally well prepared for Middle School, but more importantly, with a foundation rooted in belonging and purpose. MPA considers each child a classroom of oneâ€”an individual in the making who has a set of gifts and talents unlike any other. Teachers who care deeply take the time to understand what inspires, what engages, and what matters most to each student. Small class sizes allow our teachers are closely attuned to the gifts and challenges of each child in the classroom and they know how to bring out the best in everyone. The student teacher ratio helps ensure that each child receives the attention he or she deserves. Character is cultivated in Lower School throughout daily activities and a formal program. Student-led assemblies, focused lessons, modeling, and conflict management education help students learn about respect, inclusivity, compassion, and more from each other. Play and meaningful socialization foster students who thrive in our community emotionally as well as intellectually. They feel respected, understood, and connected, so their confidence soars. The admission process is made up of a series of steps that will help us get to know students who are considering a private school education at Mounds Park Academy. We also encourage families to join us on campus for a variety of events throughout the year as that is the best way to learn about all of the wonderful opportunities Mounds Park Academy has to offer.